I’ve finally got a chance to watch the first few episodes of The US TV series Homeland. Marine Sergeant Nicholas Brody (Damian Lewis) went missing in Iraq eight years ago, one of his friends who was there with him was found dead. His return causes quite a commotion. Not only among the public, journalists and the CIA but also in his family. He left a young wife and two small children behind when he went missing. His wife is having an affair with a friend and superior, the children are almost teenagers and estranged. And then there is Carrie Mathison (Claire Danes), an intense CIA officer who thinks that he has been turned by his captors and is plotting a terrorist attack on America. Mathison made a lot of mistakes in the past and the CIA would like to get rid of her. Nobody believes her suspicions at first, she doesn’t get funding and decides to act on her own, breaking one federal law after the other, installing surveillance cameras in Brody’s home, following his each and every move, trying to catch him making contact. The series kicks of well, it’s gripping and suspenseful, the premise, a US soldier who may only have survived captivity because he was turned, is interesting. Still, I had a few reservations. I wonder whether it is that realistic, to free someone from an eight year captivity and to push him right away to face journalists, politicians, CIA and the masses. The other problem I had, was the character Claire Danes played. She is driven and ambitious and a bit of a lunatic. On top of that she pops pills. We learn later that it is clonazepam – in other words a benzo – a heavy antipsychotic which is often used for unspecific or atypical psychosis. Hmmm…. Not sure what to think about that. Usually I have problems with the depiction of mental illness in movies and books. But I haven’t seen enough yet, so maybe they will get it right. It’s obvious that they want to make us doubt the character. It’s not an easy role, whether it will be believable in the end or not, and I think, Claire Danes does a great job. Carrie is also tracking one of the most important terrorists, Abu Nazir. When she interrogates Brody she asks him whether he has met him during his captivity and he lies and says no. As said, it starts quite good, quite intense but I couldn’t tell yet where it is going or whether I will really like it or not. But it’s certainly worth trying. This entry was posted in TV Series and tagged Claire Danes, Damian Lewis, Homeland, Iraq, Terrorism, TV series, US TV series, War Against Terrorism. hey Caroline: I don’t have cable, so my television is used to play DVDS only. I hadn’t heard of this and I know I wouldn’t like it. I am very angry about the ongoing war/occupation so I couldn’t watch this without throwing something. I understand and that’s something I’m not sure about, as far as I see, it still could both ways, be crtical of the war or supportive but I have some doubts. Series 1 and 2 are out on DVD, btw. Season 2 isn’t over, it started this fall. It’s hard to comment without spoilers… But « a thriller series whose main subject is Claire Danes » sums it up for me. In that respect it’s quite entertaining, but I wouldn’t be too sensitive about accuracy or plausibility. I overlooked the “available for pre-order” on series 2. Since it did so well at the Emmys, I’ve been planning to watch it. The leads are great actors and I, of course, remember Lewis very fondly from Band of Brothers. I get the impression it is outside the box with flawed characters – it’s Showtime. I’ll probably wait until next summer. They are out of the box but it’s still not entirely clear to me what “message” they have, if any. I get Guy’s reservations. 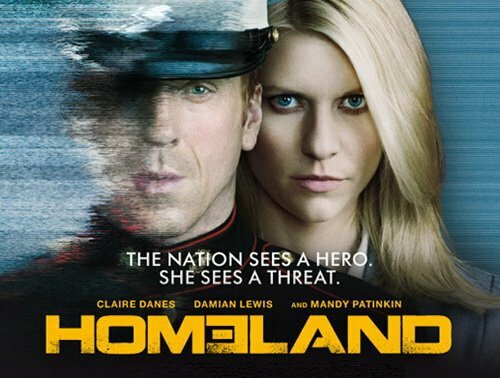 I quite enjoyed Series 1 of Homeland and its multi-layered premise. I’m an unabashed Damian Lewis fan and have seen most of his work since he made his name on Band of Brothers. He’s a fantastic actor. Homeland makes for some great viewing because you think you know whats going on and they throw in a lot of twists and turns along the way. Has he been ‘turned’ or hasn’t he? Clair Danes is excellent as the very manic CIA analyst who is fixated on him and has a compulsion to find the truth. It actually does make sense that her illness is what would make her fixate on Brodie as she does. Wether or not thats a good thing or bad unfolds over the course of the series. Mandy Patinkin is as solid as always and I wish he had more screen time as Danes’s old school mentor. Its not a chest beating ‘America F#$k Yeah’ type of show. All the characters have major flaws and everyone has an agenda, for good or evil. People and the media want to exploit Brodie, his family doesn’t know what to do with him as they have moved on with their lives in the years since he went missing/was reported dead and Brodie himself has a lot of issues trying to slip back into his previous life. It does start off slow and builds to a climax so stick with it. Series 2 is already 3 episodes in, I have them but haven’t watched them yet. Been a little busy over the past few weeks – but i will jump into them when I free up some time. Both actors are fantastic, I agree. I’ve continued watching and find it’s really good and suspenseful, there are so many loose ends and twists and turns. I’ve heard that season 2 is even better. I thought also that paranoia will be a major theme and it does make some sense to have her have an illness, on the other hand, “normal” people also believe in conspiracy theories and such. I’ll have to wait to find out more. Thanks for not spoiling it. @ allaboutwarmovies: O/T regarding the French movie “Forces Speciales”, this is now available through Amazon Instant Video as “Special Forces” for a 3-day rental at $6.99 USD. FINALLY got to see this!! Fantastic movie, terriffic ending……. I thought so too but I had a few negative comments meanwhile on my review. It seems not everyone agrees. I liked it. A lot.